We are selling this tea two ways again this year – in our usual weighed-to-order 2, 4, 8 and 16 ounce quantities and also in the traditional 500 gram (17.6 oz) paper parcel that is factory-packed and stamped with an authenticity seal, year stamp and date-of-harvest stamp. May 12, 2018 Note: The 500 gram parcel option is sold out for 2018. We are selling the balance of our sourcing of this tea by our regular size options. We will attempt to bring in more of this delicious tea, but it is likely sold out for the season in China. The harvest date for our 2018 Meijiawu Village Longjing was April 2nd 2018 – just in time to qualify as a pre-Qing Ming tea! 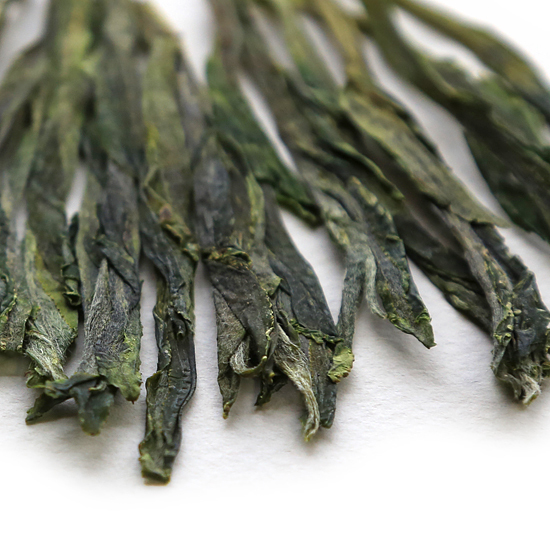 This year’s tea is one of the best Longjing teas that we have ever offered. Our Pre-Qing Ming Longjing Meijiawu Village tea is, we think, quite spectacular without being in the stratosphere price-wise. This was a fairly normal winter and spring in Zhejiang Province where this tea is made. From tasting the tea this year we realized that the weather – with its more abundant rainfall this year – has allowed for the character of the tea to return to a ‘sweeter’ style that is more traditional for this tea. Tea Trekker’s 2018 Meijiawu Village Longjing has a rich complexity of flavor. This year’s harvest is even better than last season’s (and that was very good!). The tea is rich and mouth-filling, with just enough heartiness to satisfy without feeling ‘heavy’ on the palate the way some pan-fired green teas can. The leaf is a bit larger than usual again this year. And, the tea has more flavor and more lush, buttery-ness in the cup than Longjing often has. It is also heavier by weight, so a slightly smaller volume measure may suffice to scoop the usual 3 grams used per 6 oz of water. It re-steeps well and should be an easy-to-use tea after the first pot or two have been steeped for familiarity with the leaf. Early spring days of lengthening daylight and cool weather is a terrific combination for yielding delicious tea that is full of fresh vitality and flavor. Our tea was made the first week of April, when plucking began in in earnest in the Meijiawu tea harvesting area this spring. The tea was then air-shipped to us immediately and after winding its way through various shipping portals and customs inspections (Shanghai, Hong Kong, Dubai, Leipzig, New York City and Cincinnati, and likely passing the ‘Beagle Test’ more than once, it was delivered to us on April 17th after surviving one final test just 30 miles away from us: a really dramatic but thankfully injury-free truck accident during our ice storm on the 16th. So this tea has really worked to find its way to your teapot!! Tea Trekker’s Longjing Meijiawu Village tea has the classic flavor profile that we look for in our premium green teas. This year we find the toasty, nutty, biscuit-y, chestnut-y, sweet Longjing flavor, and this season there is the perfectly appropriate toastiness in the leaf and buttery-ness in the mouthfeel. This batch of Pre-Qing Ming Longjing Meijiawu Village tea delivers more flavor than usual, something that tea enthusiasts who find PQM Longjing to be too light in taste will appreciate. The aroma is soft and sweet and has those elusive fresh green bean / vegetal notes that make this tea instantly recognizable as Longjing Meijiawu Village tea. Longjing is one of China’s Famous Teas which are the most sought after of the Chinese Pre-Qing Ming green teas. Why? Because in addition to demand for these teas from the West, demand is increasing in China from its newly affluent domestic middle class. Yes, many adult Chinese are only now discovering the scope of China’s famous teas and various aspects of their unique tea culture. As crazy as this sounds, Chinese tea drinkers are now competing with everyone else for their own tea, and this is creating pricing pressure on seasonal teas that are already only produced in limited quantities. We believe that our tea enthusiast customers will find this tea very pleasing. Pre-Qing Ming Longjing teas are generally light and delicate in flavor (sometimes ‘ethereal’ in nature) and fragrant and sweet. Chinese tea drinkers appreciate the subtle delicacy of such tender young leaves – Pre-Qing Ming teas are only made in a short window of a few weeks time and the unique sweetness that they possess is found only in these early-season teas. This year’s 2018 Meijiawu Longjing is the heartiest that we have seen in some years, due to the more bountiful rainfall and glorious weather in the tea gardens the past few months. Tea Trekker is selling this tea in our usual weighed-to-order 2, 4, 8 and 16 ounce quantities and also in the traditional 500 gram (17.6 oz) paper parcel that is factory-packed and stamped with an authenticity seal, year stamp and date-of-harvest stamp. The tea that we have is all from the same batch and from the same single tea farm no matter how you purchase it – we requested some of these factory-marked packages for customers who would like to purchase this tea in its original pack. This package, which is for the domestic China tea market, is shown in the photos. We will not receive any more of this tea – all we will have for the year is in-house now. We have been able to hold the price this year to be the same as last year – which is quite remarkable given the increase in demand from the domestic Chinese market. The origin of authentic Longjing is the West Lake (Xi Hu region) in Hangzhou, Zhejiang Province. Longjing is a protected tea (protected against counterfeit ‘Longjing’ made somewhere else in China, or anywhere) and can only legimately come from one of the places located within the National Designated Protected Zone. Our Longjing is ‘authentic Longjing’ which means that the tea is made from Longjing #43 tea bushes. This year we had the opportunity to purchase Longjing from 3 of the 4 authentic tea harvesting areas: Shi Feng, Meijiawu Village and Weng-jia Shan. Being able to taste these three choice Longjings in a comparative tasting is a rare opportunity for those who are interested in tasting the effects of terroir. Or in this case, the subtle difference / similarity of same-name products made from different farms using the same tea-making techniques within the same region. Because of the effects of terroir on the final characteristics of tea grown within the region, this tea is similar to but different than the Shi Feng and the Weng-jia Shan Longjings. All have a similar appearance – some are greener, some have a slightly more elongated leaf and bud plucks, some have a bit more early spring ‘down’ on the leaf, etc – and the flavors are similar but different, too. These differences are small, not big; they are subtle, not overblown. It is a matter of degree in the sweetness and toastiness, and the amount of mouthfeel, intensity of flavor and the length and strength of the finish. These Longjings present the tea drinker with lovely variations on an elegant theme. Like a Bordeaux wine tasting, one can conduct a tea tasting of our 2016 Longjings and happily ruminate on the results with a group of like-minded tea enthusiasts. Do not dally in placing your order – our supplies are extremely limited for this Pre-Qing Ming Longjing, and once the tea farmers sell out of it in China it will not be possible to obtain more this year.